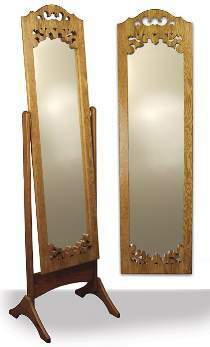 The full-length mirror tilts on special pivoting mirror hinges. The top of the frame has a pleasing Victorian scroll design. Project can also be used as a wall mirror. Requires 12” x 48” mirror. We found mirrors at both Wal-Mart and Target for under $6. Mirror and frame measure 54”H x 15”W. Complete project measures 68”H x 19”W x 16”D. Order one set of pivoting mirror hinges separately below.